Last Tuesday night, Sept. 30, Ariane Turley ’15 and Nina Stender ’16 organized an informal protest for students native to Hong Kong to show their support for current pro-democracy protests in the region. Approximately 42 universities are participating in similar solidarity movements across the nation. These movements include demonstrations, such as wearing yellow and donning umbrellas. A Facebook event called “Wear Yellow for Hong Kong on October 1st,” launched by students at Harvard University, inspired many of these protests and demonstrations of solidarity. Amy Zhang ’15 explained the rationale for protesting on the night of Sept. 30. The yellow ribbon has been utilized in the past as a symbol for universal suffrage, hence its adoption in Hong Kong’s pro-democracy demonstrations. 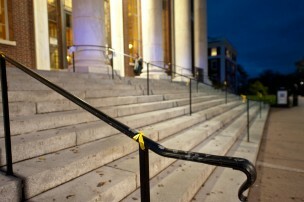 Zhang added that her original intention for organizing these demonstrations was to have an abundance of yellow ribbons placed throughout Olin, but explained that Sun Services might disapprove. “So we just put a little bit [of yellow ribbons around Olin] and we asked everyone to write things…because in Hong Kong they have this democracy wall where people write up little thoughts and messages of support, so we wanted that sort of thing for Wes,” Zhang said. There will be a forum next Thursday night in order to continue spreading awareness about the demonstrations at the University. The goal is for students of both sides of the conflict to attend the meeting and discuss the issues at hand. Suet Ning Wong ’16 explained why she participated in the demonstrations. Wong added that she and her friends initially felt relatively indifferent toward the issue. However, over time, she became more interested in becoming involved. “After seeing the images—which are definitely being blown out of proportion—such as the police using pepper spray on students who are just teenagers, [I felt] very moved,” Wong said. Protests in Hong Kong have been gathering steam over this past week. The origins of these protests lie in an announcement made this past August, which stated that Hong Kong citizens would be able to vote for their Chief Executive for the first time beginning in 2017. The issue became prevalent because previously, Hong Kong’s political and economic elite had selected this important public official, but now the Chinese government is responsible for choosing all candidates for this position. On Sept. 22, Scholarism and the Hong Kong Federation of Students began protesting outside of government headquarters. Four days later, several hundred demonstrators entered the front plaza of the Central Government Complex, a facility that has been barred from public entry since July 2014. Police cordoned off protestors and restricted their movement. Ariane Turley ’15, one of the organizers of the protest response at Wesleyan, spoke about her feelings toward the police reactions to the protestors. The videos and photos of this treatment shocked Hong Kong residents, leading to the mobilization of many citizens. Turley outlined the main objectives of this protest. Additionally, the timing of these protests is significant because Wednesday, Oct. 1 marks China’s National Day, which commemorates the establishment of the People’s Republic of China at Tiananmen Square on Oct. 1, 1949. Turley noted the significance of the timing of the event and explained why these protests are important for students and young people to follow. Wong added why she feels it is important to support these demonstrations at the University. Students spoke about their opinions regarding the conflict. Zhang added that this conflict, as well as Hong Kong in this situation, has a definitive purpose. “Here, they have a very clear goal…. They want free and fair elections for the next chief executive election without Beijing’s intervention because what they don’t want is Beijing to choose all the people they can vote for, which is what happens,” Zhang said. Zhang further expressed that she feels that most students are unaware of the facts. Furthemore, Wong noted that despite these protests, she does not think it is possible for Hong Kong to be entirely independent.